Wife, mother, a foreign woman with an accent, but ordinary. Not an orator, not really a crusader. I know her; we all know her. She is nine-years-old and naked. She stands proudly with the dignitaries, yet we all have seen her naked. Naked in the kind of pose that could get us arrested. She is not ashamed, but we are. One of the most searing images of the Vietnam War was that of a girl of nine screaming in pain and terror as she ran naked along a road after a napalm attack on her village by American forces. 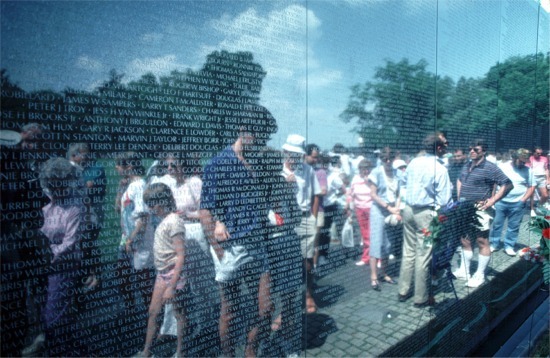 Years later, that war victim, Phan Thi Kim Phúc, was a speaker at the Washington, D.C., Vietnam Veterans Memorial. You can read her brief address here or view the famous Nick Ut Pulitzer-winning photograph, here. The poem was written 11/13/1996.